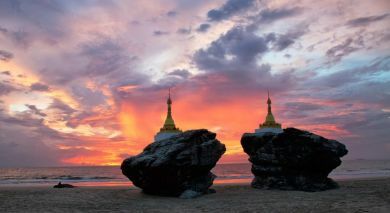 Mawlamyine (formerly Moulmein), is the fourth largest city in the heart of Lower Myanmar, 300kms southeast of Yangon and 70kms south of Thaton, at the Thanlwin river mouth. Capital of the Mon State, it was once a thriving teak port and administrative capital of British Lower Burma. 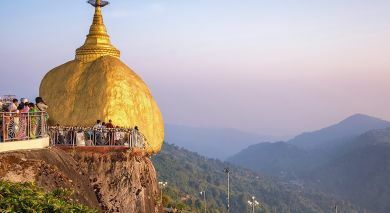 Experience Myanmar’s spiritual aura at many monasteries and shrines, especially Yele Paya Buddhist shrine that offers a a vantage point over the sea at Kyaikkami. Built in 875AD, Kyaikthanlan Pagoda is the site from where Rudyard Kipling penned his famous ‘The Road to Mandalay’ poem and is Mawlamyine’s signature landmark. Thanlwin Bridge, Myanmar’s longest road and rail bridge that spans 11000ft over the Thanlwin river is another noteworthy spot. Situated on the Thanlwin River banks close to Mawlamyine Bridge, the five-storey Mawlamyne Strand Hotel is both the town's largest and most upmarket accommodation option presently. On a 2.5 hour drive out of Mawlamyine you can see the Kyaikkami Yele Pagoda, unusual as it it built ‘in the sea’. About 30 minutess further on you will come across the Win Sein Taw Ya, the Giant Buddha of Mudon and the world’s largest reclining Buddha! 30m high and 180m long it can be viewed from great distances. Sitting across from this a huge rock formation called Kyauktalon Taung (or big stone), that houses several rooms showcasing dioramas of the teachings of Buddha, 200 images of monks collecting alms and a shrine. Although one can enjoy the novelty of walking into the giant structure, it needs to be kept in mind that this is a place of worship, and shoes must be removed before entering the shrine. 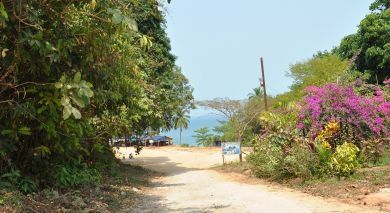 If time permits, take a trip 24kms south of Kyaikkami to Setse Beach, a resort on the Gulf of Martaban in the Andaman Sea. The Burma-Siam Railway, also known as the notorious ‘Death Railway’, lies 64kms south of Mawlamyine in Thanbyuzayat. Built by the Empire of Japan in 1943, this infamous railway once linked Thailand with Myanmar and stretched 415kms (258mi) between Bangkok, Thailand and Rangoon, Burma (today Yangon, Myanmar). Only 112kms of this line ran within Burma’s boundaries. A historical World War II site, 12,399 Allied POW’s gave their lives during its construction for the Japanese and their graves lie in the Allied War Cemetery, 1km away from the Terminus. The Death Railway Museum contains a piece of track from the original ‘death’ railway line found by a former Australian Ambassador to Myanmar. A memorial plaque and one of the original yet restored locomotives lies on the Museum grounds. You can see the famed ‘Bridge on the River Kwai’ from here, immortalised by Pierre Boulle in his book and the film. En route by car from Hpa An to Mawlamyine you can observe the flat countryside of rice paddies, sugarcane and cabbage fields as mountains rise out of the plains. You’ll see scarecrows made of bamboo, rice stalks and rice bags and pass people fishing in the canals or manually winnowing rice. Notice some caves around the Hpa An area: Kawkataung, Begyinni, Kawgoon and Saddan Caves. Along the way, take a break in your journey to visit a Karen Ethnic Village in Kayin State. The Karen or Kayin or Kariang people are Sino-Tibetan language speaking ethnic groups that reside primarily in Kayin State, also called Karen State. The Karen people weave their own clothing by hand and machine, and have many different types of traditions regarding dress that weave together a rich history for you to discover. En route by car from Hpa An to Mawlamyine you can observe the flat countryside of rice paddies, sugarcane and cabbage fields as mountains rise out of the plains. You’ll see scarecrows made of bamboo, rice stalks and rice bags and pass people fishing in the canals or manually winnowing rice. Notice some caves around the Hpa An area: Kawkataung, Begyinni, Kawgoon and Saddan Caves. Along the way, take a break in your journey to visit the Kay Yun Gu Cave, a kind of ‘Buddha Fantasy Park’ with very colorful statues depicting the life of Buddha! En route by car from Hpa An to Mawlamyine you can observe the flat countryside of rice paddies, sugarcane and cabbage fields as mountains rise out of the plains. You’ll see scarecrows made of bamboo, rice stalks and rice bags and pass people fishing in the canals or manually winnowing rice. Notice some caves around the Hpa An area: Kawkataung, Begyinni, Kawgoon and Saddan Caves. Along the way take a break in your journey to visit Kawkataunga, also known as Kawka Taung Cave temple. Outside the temple you will see a plethora of oversized cement sculptures of religious and non-religious origin such as hundreds of monk statues lined up. A small stairway nearby takes you to the top of a closeby hill where you can view many mountain ranges and shout in the wind to hear it echo back at you! En route by car from Hpa An to Mawlamyine you can observe the flat countryside of rice paddies, sugarcane and cabbage fields as mountains rise out of the plains. You’ll see scarecrows made of bamboo, rice stalks and rice bags and pass people fishing in the canals or manually winnowing rice. Notice some caves around the Hpa An area: Kawkataung, Begyinni, Kawgoon and Saddan Caves. Along the way, take a break in your journey to visit U Na Auk, a large complex of ornate temples, engrossing teak carvings depicting the life of Buddha. These temples have various architectural styles from Burmese and Chinese to Greek. The walls, ceilings and columns are intricately decorated using mirror and colored mosaic tiles, paintings and carvings. See the Kaw Hnat U Na Auk Pagoda, built 120 years ago by U Nar Auk, a historical merchant who dared to compete with British traders in colonial times.